This is the official website of Sevagram Ashram Pratishthan. Sevagram Ashram was founded by Mahatma Gandhi in the year 1936.. Online booking facility is available on the site for visiting ashram. This is the official site of Gujarat Vidyapith, Ahmedabad. Gujarat Vidyapith founded by Mahatma Gandhiji in the year 1920. Mahatma Gandhiji was Founder & Former Chancellor of Gujarat Vidyapith. It is a superb site on Mahatma Gandhi, including information about books on and by Gandhi in an on-line Mahatma Gandhi Book store which also has an online sale of bags, t-shirts, CD-ROMs, statues and more, all pertaining to Gandhi. Along with information about Gandhi Serve Foundation, there are also links to education, human rights, MK Gandhi, nonviolence and more. This is the site by the Transnational Foundation for Peace & Future Research, presents analyses, ideas, columns and debates on the present situation on the present world scenario pertaining to nonviolence, peace and harmony. Gandhi Today focuses just not on Gandhi but his relevance in today's times. Gandhi TODAY endeavours to inspire its readers to constructive living, not just wishy-washy worshipping, quotating or gossiping. It is the Gandhian concept of living, i.e. Ahimsa (nonviolence, Satyagraha (Nonviolent Action), Swadeshi (Self-reliance), Swaraj (Self-Rule) and above all, Sarvodaya (the welfare of all) and the difficult task of applying this concept to our present violent based society, that has top priority on this site. The site, both in Swedish and English, contains many articles, updates on nonviolence and its relevance in today's times world over. Nonviolence.org is one of the most highly-visible and visited peace websites, being highly ranked through Gulf War II. The mission of the Nonviolence.org mission is featuring the best writing and analysis from a nonviolent viewpoint. The site also has a discussion board, various articles on issues related to peace and nonviolence with many links on other nonviolent sites. This site is about the Center for the Advancement of Nonviolence, established in 2000 with a mission to heal, empower and revitalize lives and communities through the practice of nonviolence as a way of life. The site has many articles on nonviolence activities and also has many updates on the programmes of the center. This site by Navajivan Trust which holds the copy right of Gandhi's works has a detailed information about the trust, its background, list of publications and so on. Founded by Mahatma Gandhi, Navajivan Trust is a publishing house of great repute having to its credit publications of more than 800 titles in English, Gujarati, Hindi and other languages so far. The site is on MK Gandhi Institute of nonviolence of Arun Gandhi, Mahatma Gandhi's grandson. It has different sections on Gandhi such as biography, articles by Arun Gandhi, a chronology of Mahatma's life, his fasts, quotations, photo library, articles on nonviolence and also list of books, CDs and other items from the institute. A complete site about the biggest Gandhi museum at Rajghat, New Delhi, its library which houses a vast collection of books numbering 26000 and has a Gandhi photo exhibition with 600 photographs. You’ll find information and resources for Mahatma Gandhi the Gandhi Movement, nonviolence, peacemaking, small scale alternatives, and simple living. This site contains information on Khadi & Village Industry Commission. The Mahatma Gandhi Center for Global Nonviolence which was established in 2005 explores the significance for the contemporary world of the great task Mahatma Gandhi set for himself and for all of us as an experiment and an actual experience. Through education, international dialogues, and youth-focused programs, the Center studies and supports appropriate ways to put into practice the expression of mutual respect among human beings and for the planet's natural environment. The Center is a non-partisan and non-sectarian enterprise that welcomes both secular and faith-based participants in its programs. Its goal is to serve as a synergistic center for conflict resolution and peace-building that works for the mutual betterment of all inhabitants of our planet. Buy books on and by Gandhi. There is also a section on 'Book reviews' where one can send their own reviews. This is a site by Mani Bhavan, Gandhi Museum and Library, Mumbai and has a wide range of articles on and by Gandhi with a large collection of links to get more information on Gandhi, nonviolence, peace and conflict resolution. The site intends to expose the Indian youth to film that brings new ideas, methodology, solutions and experimentation for social change through non violence and global disarmament. A site by Gandhi Information Centre, Germany which was established in 1990 it has been freely available for Education and Culture. A beautiful site about Gandhi, his views, a photo gallery, quotations and also consists of a section, 'poems' where one can send poems on Gandhi and more. The Gandhi Foundation was set up by Richard Attenborough, well-known director of the film 'GANDHI' in 1983 to spread knowledge of the philosophy and teaching of Mahatma Gandhi (1869-1948) in Britain. Information about Gandhi Sangrahalaya in Patna with library and other services. A site by Institute of Gandhian Studies, Wardha. An important site on nonviolence, by fourth freedom forum, which explores options for the nonviolent resolution of international conflicts, it has also has articles and publications published recently. This is a beautiful site by the organisation PEP (Promoting Enduring Peace) is an organisation working tirelessly to promote peace and friendship and educating people to develop a more peaceful and thus a happy society. This site also has a section informing visitors about Gandhi Peace Prize awarded for contribution towards international peace and good will. This website works to educate and inspire people to promote peace, harmony, and well-being in the world. It upholds the ideas and ideals described in the book, Building a Noble World. Recognizing Mahatma Gandhi as one of the greatest apostle of peace, this website propagates Gandhi’s practical doctrine of resisting evil by the force of love. A beautiful site on India, its culture and festivals, landscapes, social issues, history and more, has a section on Gandhi which includes his biography, articles on him and also a select bibliography. An exhaustive online library with books on Gandhi. A brief yet informative section on Gandhi, presented in an interesting way with photographs, illustrations, puppets, Rangoli (Designs made with coloured powder), portraits, cartoons, a photo-quilt, etc. A visual treat for all those interested in Gandhi; it also includes quotes and views of Gandhi along with excerpts from some well-known books on and by Gandhi. 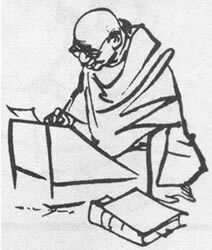 This site has a beautiful section on Gandhi constituting an online quiz on Gandhi, an article on Gandhi by Nelson Mandela and a photo album of Mahatma Gandhi, along with a photographic tour of the life and times of Mohandas Gandhi. Updated information about Peace programmes, events and needs with CPI Peace-building Community. The CULTURE OF PEACE INITIATIVE (formerly the "WE THE PEOPLES" INITIATIVE) is a United Nations-designated "Peace Messenger Initiative" - with Participants in all the world's regions. The Satya Graha Forum seeks to get a conversation going about non violent strategies as practiced by Mahatma Gandhi and Martin Luther King Jr. This coming April various cultural organizations in New York City will be holding events that relate to the subject. Offers professional healthcare services to traditional medicine system based healthcare centers and hospitals. For existing centers, offers to take the centre on lease or on management contract basis. Also offers management audit for existing centers. At the end of audit we submit a report containing evaluation of various departments and our recommendations for improvement. Gandhi's voice recorded while he was giving a talk on "My Spiritual Message." A beautiful section on Gandhi, with articles on Gandhi by Richard Attenborough and Louis Fischer. A beautiful section on Gandhi, his life and work. This site on Nobel prizes, has a section on Gandhi's Nobel nomination. This section has articles on Gandhi's life, his writings and a chronology on his life. The BBC news site has a page on Gandhi and has put some current news on Gandhi. The website is dedicated to Mahatma Gandhi's pious thoughts on spirituality. The website is targeted towards youth empowerment to develop responsible young world citizens. The Spinning Wheel Sleuth : A newsletter about Spinning Wheels and related tools, provides detailed information about Chrakha (Spinning Wheel). Russian website. Devoted to Mahatma Gandhi, his life, work and philosophy. Gandhi quotations and links reflect his ideas about spirituality and non-violent action, as well as his deep commitment to individual liberty and the minimal state. Earthcare Books is a publisher and distributor of books on environmental issues and just and sustainable development. Selling worth-reading Gandhi books under the category of 'Gandhian vision'. Promoting Sarvodaya Social Order – a society based on the principles of Welfare of all, equality of all, respect for all, a society built on the foundations of truth and nonviolence, compassion, cooperation with the spirit of understanding, tolerance, peaceful coexistence, human values, Peace with Justice in a sustainable world. Website of the M. K. Gandhi Institute for Nonviolence, a nonprofit organisation that works to realize the vision of its historic namesake. The M. K. Gandhi Institute helps individuals and communities develop the inner resources and practical skill needed to achieve a nonviolent, sustainable and just world. Located at the University of Rochester, the M. K. Gandhi Institute collaborates with other nonprofits, academic institutes, students and driven peacemakers. A tribute to Mahatma Gandhi through Memorabilia by Gandhi World Foundation. Tarun Bharat Sangh seeks to bring dignity and prosperity to the life of destitute section of rural India through sustainable development measures. It works for the holistic development of men, women, and children, regardless of economic situation, caste or religion. Working for the empowerment of rural communities, TBS believes in Gandhian approach of Gram Swarajya-village self rule. A website dedicated to Mahatma Gandhi - Father of the nation. Website of Gandhi Centre for Rural Development (GCRD); spearheading the Swadeshi movement in accordance with the ideals of Mahatma Gandhi for the realisation of Gramaswaraj through Swadeshi and Self-reliance. A website of Nature Cure centre, situated at Pune, Maharashra, India. Providing complete information about Nature Cure treatment. A website propagating Gandhian philosophy among society.